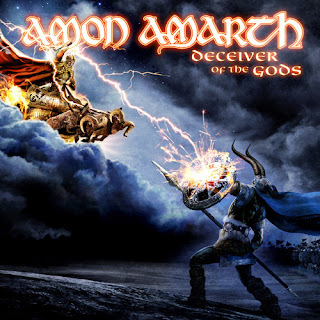 Hall of the Mountain King: Review: Amon Amarth, "Deceiver of the Gods"
I remember once reading a review that said something to the effect that to not like Amon Amarth was to not like heavy metal. I wish I’d written that because I wholeheartedly concur. Amon Amarth represents all that I love about the raw power of the genre. It’s ugly, it’s gnarly, it’s brutal, but at the same time there’s a great beauty in what these Vikings do. It speaks to some primal instinct in me, makes me want to pound my chest and gnaw a little bloody meat right off the bone. It’s why when I get ready for a workout, the playlist is filled with their stuff. On Deceiver of the Gods, the band doesn’t change up a whole lot. Amon Amarth at its best combines a death metal intensity with the grooves and melody of classic heavy metal. If it ain’t broke, don’t fix it. 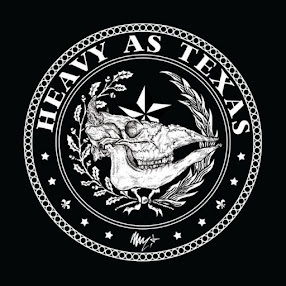 They do give themselves a little leeway here to try some new things, and you’ll find some thrash-influenced bits and even a touch of New Wave of British Heavy Metal. There’s a particularly striking bit of that latter near the midpoint of “As Loke Falls,” that’s a little surprising, but nice touch. With every Amon Amarth album, there’s always that one song that makes me want to slam my sword against my shield and shout along every time I hear it. That song for this record is “Father of the Wolf.” The melody is pulled straight from classic metal with more of that NWOBHM influence, and Johan Hegg roars out the chorus with the full might of Hell behind him, or, I suppose in this case, Hel. And speaking of “Hel,” she gets her own tune, too, with a special guest performance from Messiah Marcolin, former singer for doom masters Candlemass. His influence is apparent early in the mid-paced riff of the tune, and the ooohooohohoh choral vocal melodies on the song are certainly a first for Amon Amarth. The warbling voice of Marcolin and Hegg’s death growl mix surprisingly well. Though I didn’t know how it was going to work, it turns out to be one of the highlights of the album, bringing a bit of wickedness and subversiveness to the band’s usual alpha display of power. There’s a good mix of snarling, bashing speedsters and heavy groovers on the record. I’m surprised it’s taken Amon Amarth this long to get around to writing about the “Blood Eagle,” since it seems an obvious subject for them. For those not familiar, it’s a legendary Norse execution in which the victim’s back was cut open, ribs cracked and lungs pulled out through the wounds. There is some debate by historians over whether it was ever used and, if it was, the exact process. The tune, though, is as vicious as the torture of its title. On the other end is the galloping “Shape Shifter,” with a chorus that soars like the eagle that the song’s character becomes, and the mid-paced “We Shall Destroy,” which offers up a very nice headbanging groove toward the end. The Swedes even take a shot at the epic on eight-minute album closer “Warriors of the North,” which opens with a kind of progressive guitar sound before building into a more recognizable Amon Amarth rhythm that allows you to feel the waves breaking against the sides of the longboats. There’s another catchy classic metal riff that pops up for a few seconds here and there, there’s a little bit of a thrash gallop and a lot of intertwined melodic guitar harmonies from Johan Soderberg and Olavi Mikkonen — who manage, as always, to inject a lot of melody throughout the album without taking away from the heaviness. The song plays more like one of the epic poems of the band’s Norse heritage than a normal song, though a more standard hook does emerge toward the end. There are bands that play faster. There are bands that play louder. There are bands that play uglier. But I don’t believe there’s a band that captures the primal spirit and essence of heavy metal music in all its glory any better than Amon Amarth. When played at high volume, which is the only way that it should ever be played, Amon Amarth, at least for the moment, imbues the listener with the power and immortality of the Norse gods and warriors who are the subjects of their songs. And that’s something that every metal fan needs every now and then.